One of the most welcome features in the latest generation of big boats is the large windows in the hull. It’s extremely pleasant to lie in bed and look at the sea, and just as pleasant to have all that natural light coming aboard. The latest development of the Fairline Squadron 58 is well endowed with hull glass - and, of course, with a great many other features. Unlike with many large imported boats, all of the 58’s deck area is easily reached and designed to be used. 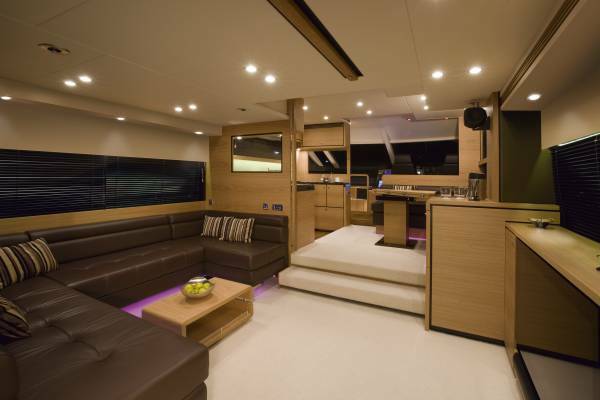 And adding to that open space is a huge flybridge that is almost as large as foredeck and cockpit combined. At its forward end a driving console with twin seats has sun beds on three sides; minus the sun they make excellent day lounges. Aft there are seats for eight or nine around a table placed in happy association with a wet bar. 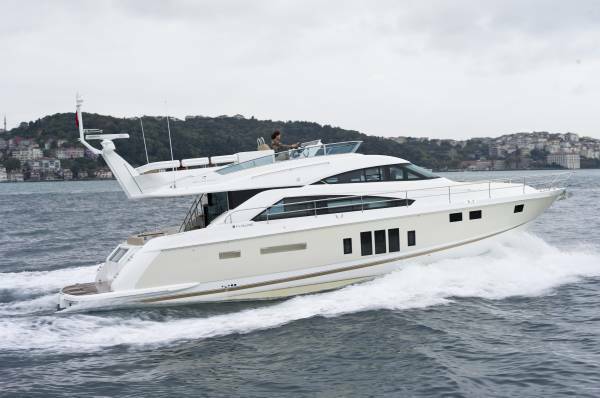 Fairlines enter Australia without canopies. 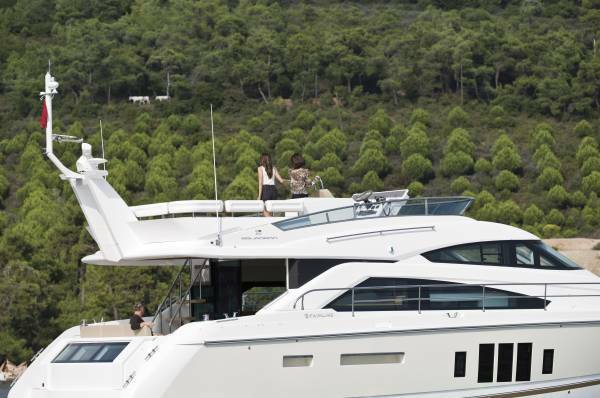 One reason is that canopies are one of the few unattractive things that Fairline make; the other is that Europeans do not sit on Rottnest moorings with 20-knot sea breezes, so they do not fit clears. The advantage to this is that buyers fit whatever kind of canopy they want, and canopy makers in WA, connoisseurs of shade, make them very well indeed. The cockpit has solid shade from the flybridge, which extends to the cockpit rear. This is another spacious entertaining location equipped with the usual cold storage, barbecue and settee. The boarding platform provides spillover space and a gearing up spot for divers. And for their further convenience a ladder and a swing up overhead shower are laid on. A lower control station takes up part of the interior space but it still leaves a very large saloon, made apparently larger by the vast glass area. The food preparing and eating departments are side by side forward, and linked by a step to the uncluttered lounge and entertainment area. This in turn flows via wide doors to the cockpit. There is room for a corporate cocktail party. The main sleeping accommodation comprises two doubles and a twin plus two bathrooms. All the compartments are large, but the owner’s midships suite verges on palatial; and why not? It takes up the full 4.85m beam, has a superbly comfortable queen size bed, and has walking around space between wardrobes, vanity, occasional tables and the like. A definite home from home. Like the other compartments it is equipped with TV and air conditioned to tropical standards. There is actually another cabin. Called a crew cabin it can be ordered purely as storage space, but Australians mostly stay with the cabin interpretation and call it a teenagers’ retreat - although, for the occasional long trip, some owners have engaged a skipper. Entry to it is from the boarding platform, and it features wide aft-facing windows. 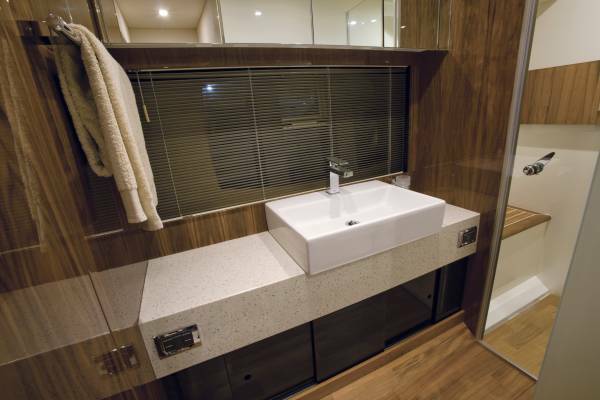 Containing an en suite, it is compact rather than small. Main power is supplied by a pair of Volvo D13s delivering 800hp apiece standard, or 900 in uprated form as in the review boat. These were good for 32 knots flat out, giving a wide choice of cruising speeds. The exhausts are well muffled and the engine room insulated, and the full beam wardrobes of the master suite add an extra sound barrier. Although it is rare to sleep with main engines running it would be easily done with the resulting very low sound levels. 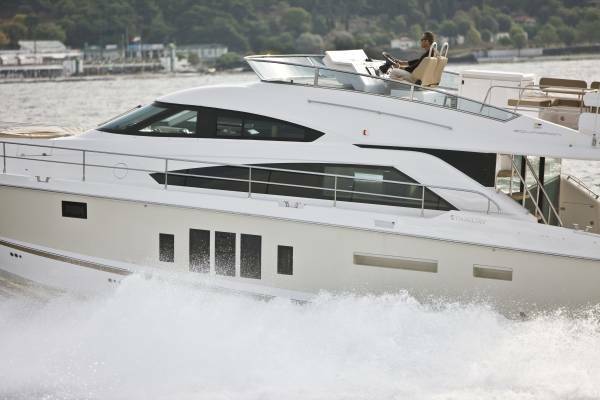 Unlike most imported cars, the price of imported boats closely follows exchange rates. For boats from Britain this has meant dramatically reduced prices in recent times. Currently, the Squadron 58 costs from $1.742M for a well-equipped boat; most owners will want extras on top of this, so $2M is a likely invoice. I freely admit this is well beyond me, but I can see a lot of value for money.